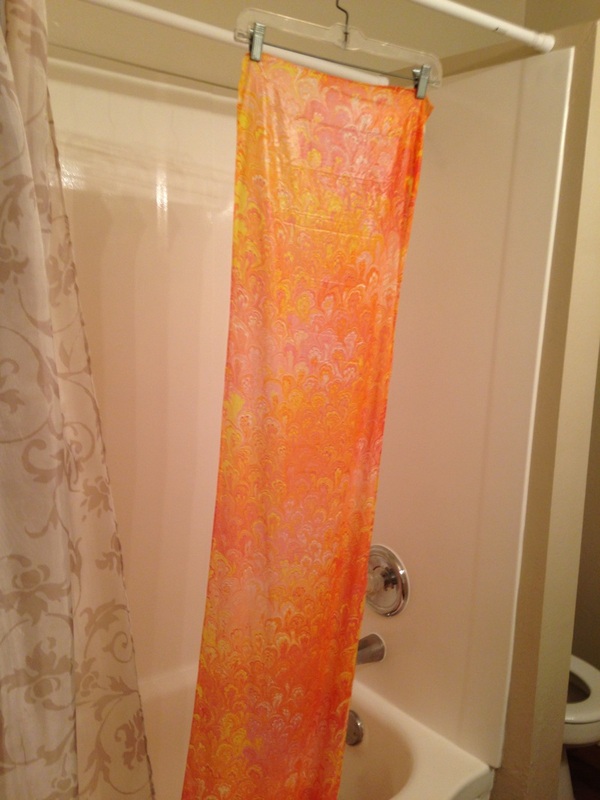 Q. I just designed and created my very own hand-painted silk scarf. You sent it home with me in a bag, and it's wet. Now what do I do? ​Tonight: BE VERY GENTLE WITH YOUR SCARF, as the paint is still malleable. Handle it as little as possible. 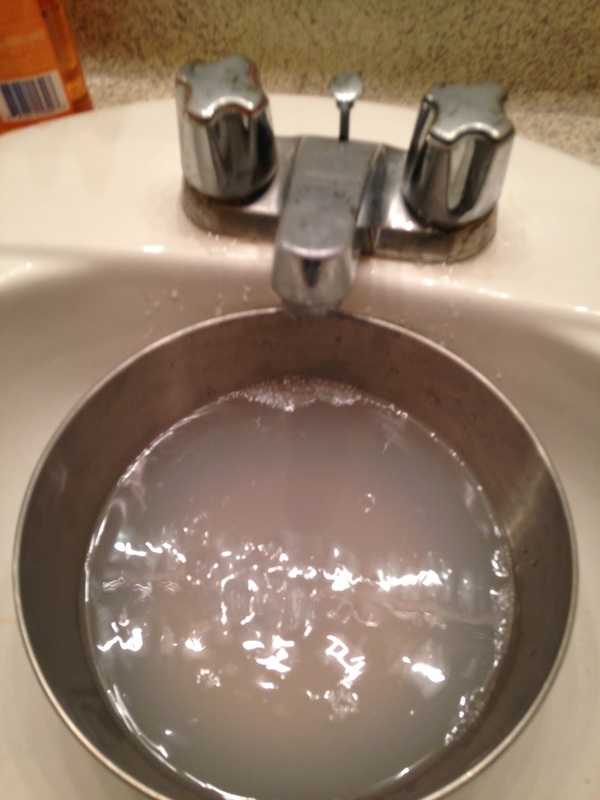 Fill a sink or bowl with some cold water (add a small amount of liquid fabric softener, such as Downy, Dreft, or any store brand, if desired). 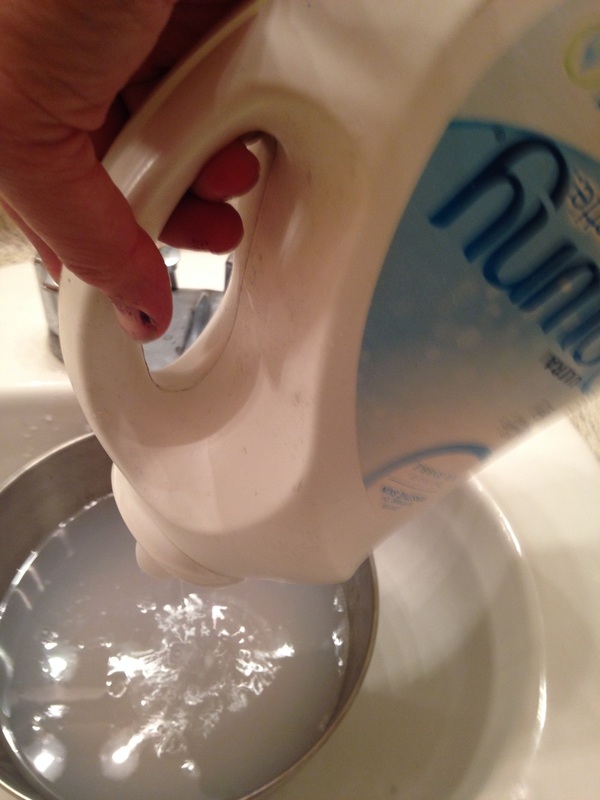 ****Helpful Hints: Bring a bowl or ice bucket to the bathtub or laundry room basin and fill it there. If you don't have softener, but want to soften your fabric, you can use regular hair conditioner. Remove the scarf from the bag and place it into the water. This is to let the water help you unfold it - not to wash anything out of it! Let it sit in the water for about one to three minutes (if using fabric softener, let it soak an hour or overnight), give it a swish or two to release the wrinkles, then take straight out of the water and hang it to drip dry. Do not twist, wring or squeeze your scarf! 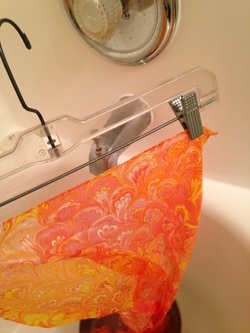 You can hang your scarf from a skirt hanger with clips, or drape it over the [clean] shower bar. Hang until dry. Once dry, you can wear it gently, or leave it on the hanger or lay it over a chair, or even gently fold and place it between layers of paper in your luggage. For best results, allow your scarf to continue to dry for at least 12 hours before ironing. KEEP IT OUT OF THE SUN UNTIL IRONED. Iron on back side on a HOT setting (I use the lowest cotton setting) to heat set the colors, and create a silky smooth finish. *******Please do not skip this step - ironing is important to make it sun-safe and washable, and to prevent future fading!!!! Your item is now ready to use and enjoy! Q. 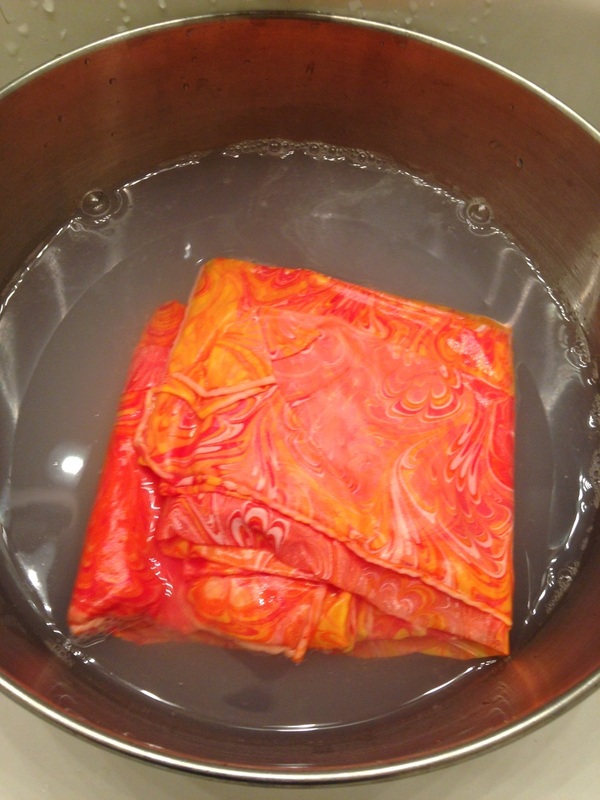 How do I care for my ready-to-wear scarf or other water-marbled items? You may use Dryel Dry Cleaning System in your home dryer, but it's costly and not necessarily any better than washing by hand. 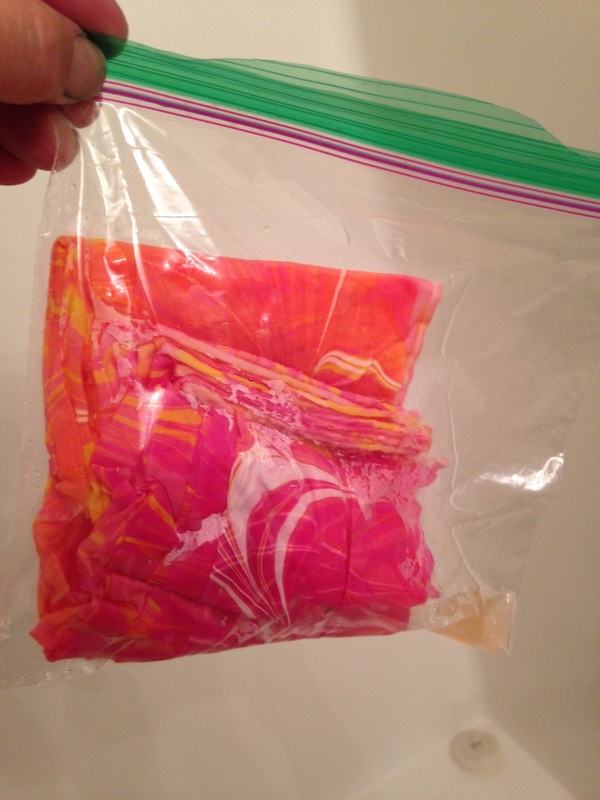 Helpful Hint: When traveling, your dried silk item may be wrapped gently in tissue and placed in a zip lock bag; blow a puff of air into the bag before sealing to create a bit of cushion around the silk, and place in your suitcase. Hang it up when you reach your destination; hanging will usually remove most wrinkles. Q. Do I have to use fabric softener in my initial care? Can I add fabric softener at a later date? Some folks prefer the crisp feel of the silk WITHOUT fabric softener. Whether or not you choose to use fabric softener, the silk will get softer the more you use it. If you desire to soften you silk at a later date, that's fine. 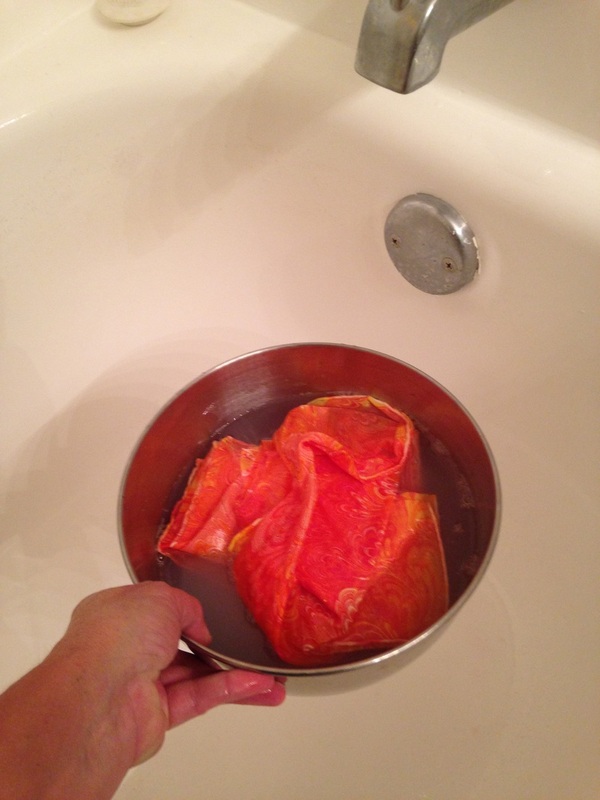 DO immerse the silk in cold water tonight (or as soon after painting as possible) and hang to dry, then iron after at least 48 hours, as shown above. After that, if you desire to soften it more, just put some liquid fabric softener and cold water in a bowl or sink, add your silk and swish a few times. Let it soak for a few minutes, then hang to dry. Iron when dry. Still have questions? Call us at (949) 424-3458. P.S. We love photos! If you get a chance, we'd love to see a photo of you (or your recipient) enjoying your finished design!! Email your photos to info@mayusilkart.com or tag us on Instagram or Facebook. Thanks!! !